The Basics of Stud Poker …. Players receive a mix of cards, some face down and some exposed face up. Play doesn’t follow a set order and the first player to act is decided based on the value of the exposed cards on show. Usually five betting rounds per hand and played in a Fixed Limit format. Stud is possibly one of the most well-known poker games in the world. 7 Card Stud is a classic poker game which was formerly the most popular and widely played until Texas Holdem came along and took over that title. Stud poker dates back to the American Revolutionary War when 3 card stud was played. Then during the American Civil War the Five-card stud version started to take off. In more recent years Seven card stud has become more common, both in casinos and in home games and you will rarely find the 3 or 5 card version any more. Seven Card Stud forms the basis of most modern stud poker variations where each player receives a mix of cards some face down where only that player can see the cards and others face up where the cards are exposed for all other players to see. The cards dealt face down and not on show to opponents are called the hole cards or down cards and the cards that are exposed are called the up cards. Stud poker games are also different to other poker games in that they are non positional. Where as other positional poker games follow a set order and pattern on each round of betting in Stud the player who bets first may be different from round to round and is usually decided based on the value of the exposed cards on show. Stud is usually played with five betting rounds per hand and is more commonly played in a fixed limit betting structure. The stakes of a game will be described by two numbers such as $1/$2. The fixed limit betting structure will then allow bets in increments of the small bet ($1) for the first two rounds and then in increments of the large bet ($2) in the final three rounds. Each player will also have to pay an Ante into the pot at the start of each hand which is a cost of being dealt into the hand and ensures that each hand starts off with some money in the pot to win. In stud poker each of the betting rounds will be named after the number of cards each player holds, so when players hold 4 cards each then it is called “Fourth Street” etc. 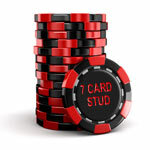 If you are just starting out in Poker and looking to learn Stud Poker then we recommend that you start by learning how to play 7 Card Stud as it is the most popular Stud poker game and forms the basis for most other Stud varieties.